Items per quantity: Pack of 10 labels. 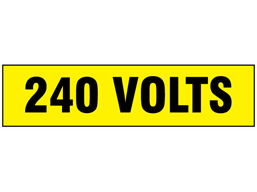 240 volts label. Part of our voltage and electrical equipment label range. Available in 3 different sizes of marker. Voltage and equipment markers. 240 volts label. Available in 3 different size stickers. These labels comply with the Electricity at Work Regulations 1989. VML240A Size 55mm x 225mm. Material self adhesive vinyl. Single unit of issue. VML240B Size 25mm x 110mm. Material self adhesive vinyl. Supplied in packs of 4 labels. VML240C Size 13mm x 55mm. Material self adhesive vinyl. Supplied in packs of 10 labels.